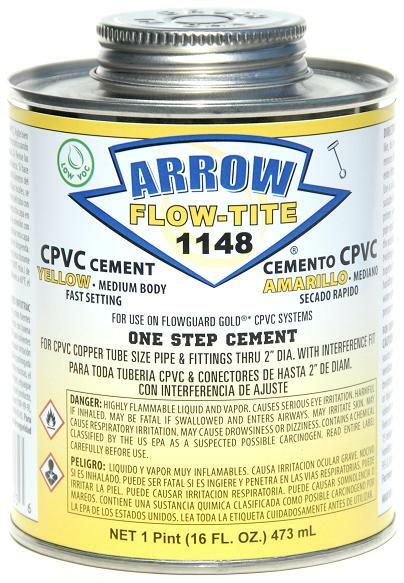 1148 is a medium bodied, fast setting CPVC cement for use on copper tube size (CTS) CPVC pipe and fittings up to 2” diameter with interference fit, including Flowguard Gold® (Registered trademark of The Lubrizol Corporation). Formulated for use as a ONE STEP product, where the use of a Primer is not required where local codes permit. Meets Low-VOC emission limit as outlined by South Coast Air Quality Management District (SCAQMD) 1168/316A and BAAQMD Method 40. Compliant with LEED® (Leadership in Energy and Environmental Design). When using this Low-VOC product , can be claimed for LEED Green Building Rating System – Indoor Environmental Quality. Listed by NSF International for compliance with ASTM F 493, the Uniform Plumbing Code, NSF/ANSI Standard 14, NSF/ANSI Standard 61 for use on potable water, drain, waste, vent and sewer applications (pw-G-dwv-sw) and NSF/ANSI Standard 372 ‘lead free’. 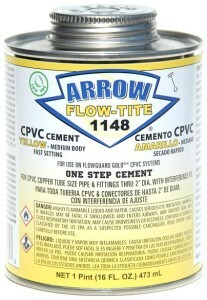 Formulated for use in residential, commercial and industrial cold and hot water CPVC piping systems up to 180°F (82°C).